Eriocaulon Parkeri is native to the eastern North America. Eriocaulon Parkeri is a great starter eriocaulon because of its ability to adjust to different water parameters, but that hasn’t seemed to help it in its natural habitat, as it is endangered in a number of areas. Eriocaulon Parkeri is a smaller eriocaulon that will propagate by forming daughter plants that can be pulled easily from mother plant. Eriocaulon Parkeri looks great in the foreground around stone and wood pieces. You will get 30 seeds. 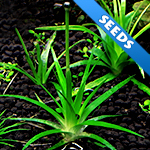 Special offer - Buy any 3 packs of seeds and get one FREE!